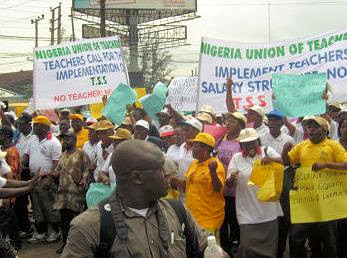 The Nigeria Union of Teachers (NUT) on Thursday gave a two-week ultimatum to the Federal Government and the Academic Staff Union of Universities, ASUU, to resolve the strike embarked upon by university lecturers since 1 July. The NUT President, Mr Michael Olukoya, gave the ultimatum in Abuja at the end of the union’s meeting with teachers’ representatives across the country. The News Agency of Nigeria (NAN) reports that ASUU, had on July 1, embarked on a strike it described as “comprehensive, total and indefinite”. The lecturers are protesting the non-implementation of some issues, contained in an agreement the union had entered into with the Federal Government since 2009. Olukoya said that members of the union would not hesitate to close down the nation’s schools, if the two parties failed to reach agreement after two weeks. He described the current ASUU strike “as nationalistic, patriotic and self-sacrificing. The NUT president said that Governor Adams Oshiomhole of Edo’s call for a complete over-haul of teachers’ qualification as unacceptable to the NUT. He said that the blame should be put on the doorsteps of the employers and not teachers. Olukoya also urged the governors of Kogi, Benue and Cross River to honour the agreement they made with teachers on the payment of 27.5 per cent teachers salary structure. There is a wise saying that “when two elephants fight, it is the grasses that suffer” ASUU and FG are the two elephants now and we students are the grasses that suffer. please FG and ASUU, we are losing our trusts, we are tired of all these deciectful actions of urs!!! the more u delay us, d more u ar delaying this nation’s future.what do u expect student to do again? where is d money to go into apprenticeship? some parents are only managing to send their heirs to school! stop waisting the time of thhe less privilege. let FG agree with ASUU. We d student are tired of staying at home pls. I also want to use this medium/opportunity to advice some student to fine smth doing because nobody knw when dis strike will be over. Help us beg both parties we don tire! I do respect ASSU for dia Antrepidity! I also respect FG for dia Inclination! I moreso respect student student for dia Mettlesome! But pls let’s finally fear God nd puzzle out dis issue of strike !!! I thank the Fg,for giving me the opportunity to attain to my project,while on strike.Let them call off the strike on january 1st,am not begging them o.You think they dont have young children like us,they do. FG & ASUU should resolve their differences & call off d strike cos its really not funny anymore. ASUU u have to call off the strike or we can fine other place to study bcos our brain cannot tolerate anykind of decieveness. Therefore, I urge ASUU to press on, maybe this time we will have it right at least for once. Is a battle to finish! Government should know that ASUU knows that they have the money.If that’s the case then the FG ironically mocks ‘US’ the students by refusing to pay the money and feed us with the crap that ‘youths are the future of tomorrow. How can that be when they’re bringing the educational system to its knees. Nigeria! What a country. JONATHAN!!! Remember that this is never what we bargain 4 when we voted u into dat seat. Resolve ur case with ASUU,4 d sake of d frustrated students. Our counterparts in other countries are laughing at us.